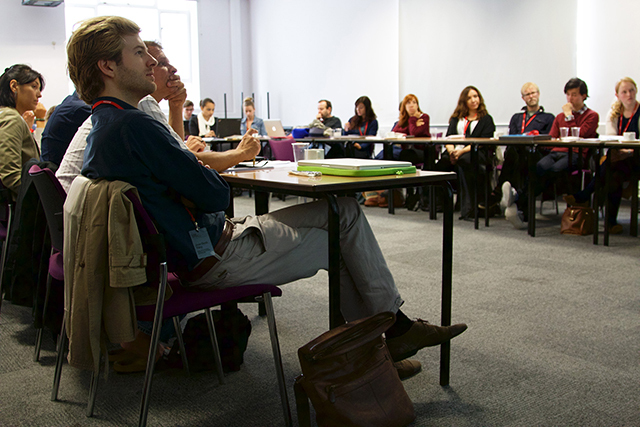 On 1 September 2015, the 3rd VELUX Daylight Academic Forum was held at London Metropolitan University. 25 PhD students from 10 different countries met to focus on daylight, its effects on people and the environment. The VELUX Daylight Academic Forum provides an opportunity for PhD students to present and discuss their ongoing research projects with other fellow PhD students, and to receive feedback from a panel of independent scientific experts in order to help stimulate them and encourage high quality research in the field of daylight, and meet fellow students and create a community among PhD students across Europe. The VELUX Daylight Academic Forum takes place every second year one day prior to the VELUX Daylight Symposium. The VELUX Group organizes the Daylight Academic forum to strengthen collaboration with academia and support students working with daylight, fresh air and sustainable living in buildings. Since the first VELUX Daylight Academic Forum in 2011, other conferences and fora have been established – to ensure and strengthen the dialogue with the next generation of lighting researchers. ….. In a very short time you and the other mentors have pulled together strangers based on a common intellectual interest and to each have instilled a sense of belonging to a fantastic collaborative group. ….. It was crucial for me to observe the progress of my colleges PhDs, especially ones I had been introduced to during the academic meeting in Berlin last year. We all matured and the conversations we had were inspiring and beneficial. The other advantage is that we’ve started to cooperate so please await some collaborative papers to appear. The level of and complexity of some PhD research were really high in my opinion. ….. It was full of knowledge and new information, the atmosphere was great and I’m glad I have met many experts on the field and made networking with them and peer PhD students. ….. I was very happy to meet so many interesting people and exchange ideas and getting feedback from all of you.